We are fundraising to save our fantastic community cider hub! We’ve been rescuing London’s apples and pears from rotting and turning them into scrumptious cider and juice for the last two years. The project has been a great success, but due to the funding ending, we are now calling on our faithful supporters and volunteers to get involved with keeping the project alive. 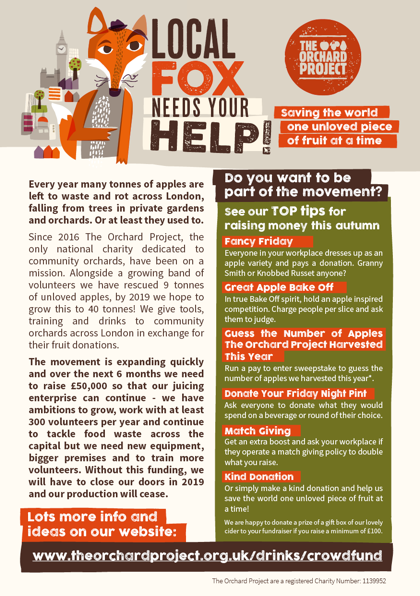 Here are five easy ways you can support our crucial Crowdfunder to stop apples going to waste and keep the juices flowing! Fancy Friday: everyone in your workplace dresses up as their favorite apple variety and pays a donation. Granny Smith or Ballerina Flamenco anyone. Get some inspiration here: https://www.orangepippintrees.co.uk/apple-trees. Great Apple Bake Off: In true Bake Off spirit, hold an apple inspired competition. Charge people per slice and ask them to judge. Guess how many apples we harvested this year: run a pay to enter sweepstake to guess the number of apples we harvested. Buy The Orchard Project a Round: ask everyone to donate what they would spend on a beverage or round of their choice. Match Giving: Get an extra boost and ask your workplace if they operate a match giving policy to double what you raise. In-Kind Donation: Simply make a one-off donation, feel good, help us save the world one unloved piece of fruit at a time! Download our e-flyer here and share it on social media!